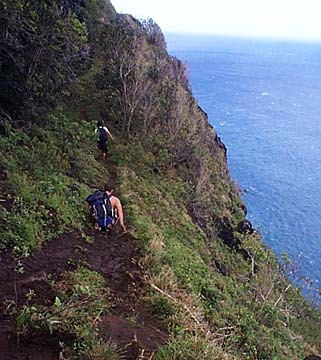 Hikers along Kauai's Kalalau Trail enjoy the views of the rugged jungle terrain. A "Kauai Visionaries Jungle Retreat" will take place April 15 to 24 in Kalalau Valley, allowing the spiritually inclined to walk its trails with bare feet and explore the jungle once inhabited by ancient Hawaiians. The retreat encompasses four nights in Anini Beach House, five nights of outdoor camping, an 11-mile hike, food, and activities including yoga, qi gong, freedom dances, ceremonies, meditation, swimming and snorkeling. The retreat is being presented by Freedom Dances, an organization that utilizes movement and dance to inspire and empower. Visit www.freedomdances.com/events for more information.